I noticed a huge performance drag after updating the firmware and drivers of my XPS 15 9550. The update took place on August 4, 2016. Performance of my usual apps (Chrome, development tools and IDE, etc.) went dramatically down. Typically, I would say things take about 3 times longer to happen. I checked CPU usage (normal) as well as memory consumption (also normal) to find out that the issue comes from the SSD drive. On this laptop: 500Gb NVMe thnsn5512gpu7 NV (toshiba). 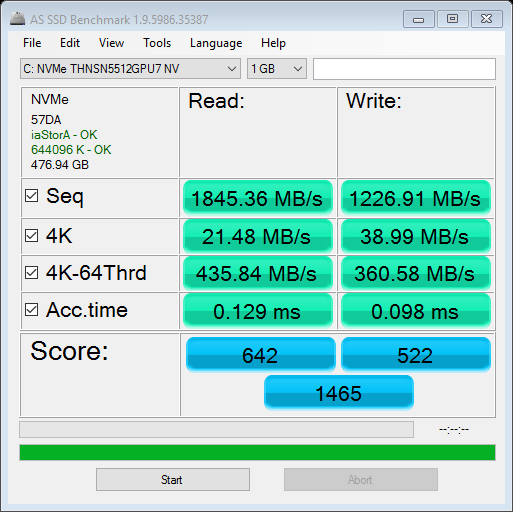 Attached are the results of a benchmark run with AS SSD. All write speeds are abysmal, to say the least... that explains a lot, but I have no idea how to solve that issue, and whether or not it is really related to the latest firmware+drivers update shipped by Dell. Any idea? Other users impacted in a similar way. Thanks in advance. Did you ever figure this out? I've got a Lenovo Thinkpad X1 Carbon with the same disk (thnsn5512gpu7) and I get the same<ADMIN NOTE: Profanity removed as per TOU>poor write speed. Read is great though. The PC is brand new, and this is not what I expect. roll back to the previous BIOS - I don't trust version A10 after it made the screen flicker worse, which the update was supposed to fix. Wont be surprised if its 'broken' other things. 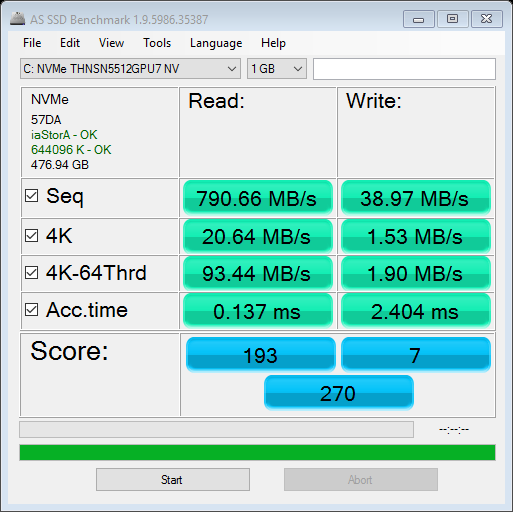 I never benched my SSD after the update when I had it installed but I have now since rolled back and performance is super fast on my 1TB PM951. @Simba: unfortunately, for my current service tag, the only BIOS available on dell.com is XPS_9550_1.2.10.exe released on July 5. As for the Intel Rapid Storage Technology Driver, same thing: the only version available is Serial-ATA_Driver_6K2TK_WN32_14.5.2.1088_A00.EXE released on Oct 25, 2015. There is no "Older version available" for the above 2. Not sure how to roll back then. you wont find the previous bios versions in your service tag my account drivers download page. Its the same for everyone with the XPS 9550. The BIOS isn't configuration specific but model specific so BIOS for 9550 applies to all 9550 users. pretty much all the latest and previous releases can be had from there. The rapid storage technology driver is the earliest release it seems given by the A00 revision. There is however a later release of this which is 14.8.9.1053. Iv filtered the page for XPS 9550 so should take you straight there. Hope this has been helpful. I managed to get the performance back by going into the disk properties and turning off windows write cache flushing. Both checkboxes should be checked. Write speed went to about 1400 Mb/s then. Thank you Simba, great tip. I will try this in the afternoon and update the thread after that. Will keep the Intel Rapid Storage version I have as it is for now. Indeed, much better. See results attached. Still slow with most apps though. Next up: reverting to the old BIOS. Reverted to the older BIOS - still poor 4K read times... leading to poor performance in IDE (Eclipse) or browsers (Chrome) for instance. I remember that on the same day, Windows pushed the Windows 10 Anniversary update. Could it be correlated to that? Any update from other people impacted by this issue? Since I'm having this issue on a Lenovo and not a Dell it might not be totally relevant, but mine is running Enterprise edition and IT at work has deferred the aniversity update for now. So I atleast experience this on the "plain" windows version.